We are one of the trusted companies of Electron Backscatter Diffraction Equipment. Our products are enormously admired in the market owing to their top features. - EBSD - Electron Backscatter Diffraction - analysis is a very powerful tool for microstructural characterisation. we deal in High Resolution Electron Microscope. We are deal in Carl Zeiss Evo 10 Scanning Electron Microscope. Our reputed entity is engaged in supplying Scanning Electron Microscope. 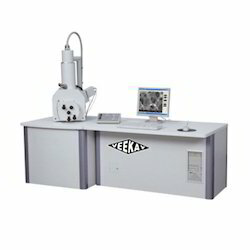 Electron Microscope offered by us is manufactured using best available techniques and under the firm direction of experienced quality controllers. Being the leading names of the market, we are betrothed in providing an extensive range of Table-Top Scanning Electron Microscope to our honored consumers.